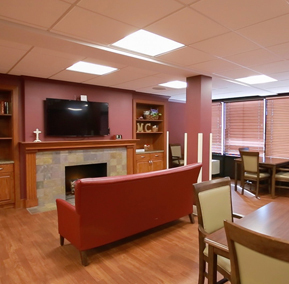 Maple Crest Health Center’s approach to rehabilitation means helping residents reach their goals and maintaining the highest levels of independence. 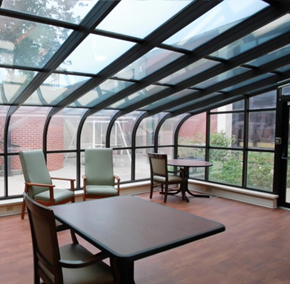 To assist in accomplishing their goals, we feature a truly cohesive interdisciplinary rehabilitation team. At Maple Crest your rehabilitation process begins with an evaluation from our licensed therapist. The evaluation allows our team of rehab specialists to develop an individualized rehabilitation program. Your specific program is created with input and direction from your personal Physician and continually updated to make certain you are progressing as expected. Maple Crest provides physical therapy services to help individuals regain strength, improve functional skills, coordination and balance. An individual’s functional abilities may have diminished due to a number of different circumstances such as: illness, hospitalization, fractures, stroke, arthritis, Parkinson’s disease, cardiac disease, amputations, complex surgeries and other medical and neuromuscular diseases. Regardless of the condition, our physical therapy programs help residents achieve their goals and return to the daily activities of living, and a lifestyle to which they are accustomed. The Occupational Therapy services at Maple Crest help residents regain the ability to perform self-care tasks and Activities of Daily Living (ADL). For example, therapists assist residents as they relearn fine motor coordination and visual perception, increase upper body strength and improve dexterity for bathing and dressing. Our occupational therapy program also evaluates wheelchair positioning to avoid soreness, reviews splinting needs and performs home safety assessments to make certain residents can return safely home. Maple Crest offers a complete speech therapy program to assist individuals in learning and mastering new communication skills, compensate for hearing loss and manage difficulties with chewing and swallowing. The program can also be a benefit to residents who may suffer from oral motor dysfunction, memory loss and reduced comprehension. The overall goal of this program is to support residents as they regain their skills while remaining socially engaged. Maple Crest’s restorative nursing programs are individually designed to guide residents following discharge for their active rehabilitation program. The goal of these programs is to continue working on the tasks identified by the therapist and maintain the compensation skills learned throughout the resident’s therapy program. In addition, our restorative nursing program is designed to prevent the decline in an individual’s functional abilities by maintaining an active strengthening, balance and coordination exercise program.